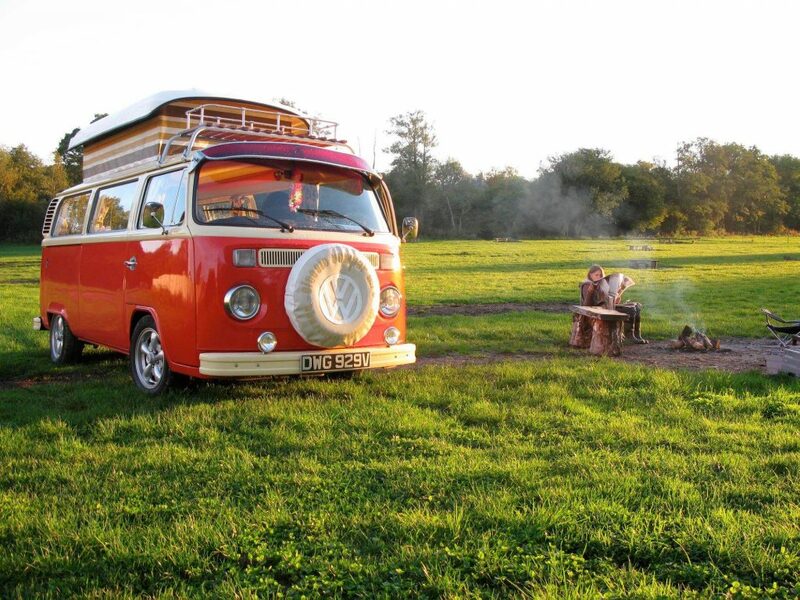 Spring is here and if you fancy taking a dog trip in style, there are some great dog-friendly vintage camper rentals (for self-drive) which can help you explore all those beautiful places in the UK in a retro fashion. 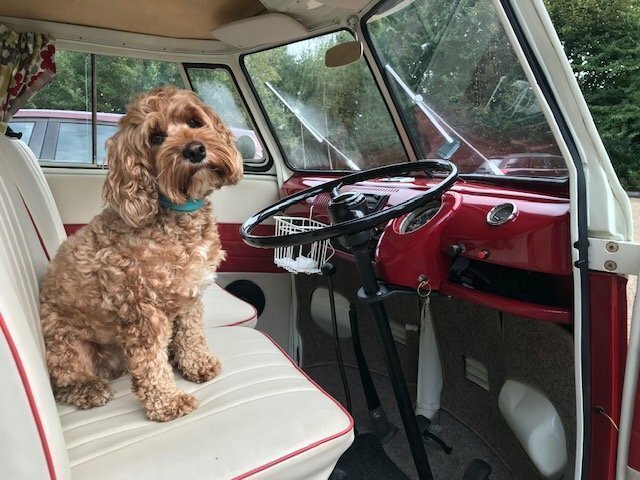 In this post we tell you where to hire a colourful dog-friendly vintage Volkswagen (VW) camper for heading off to your next dog adventure. 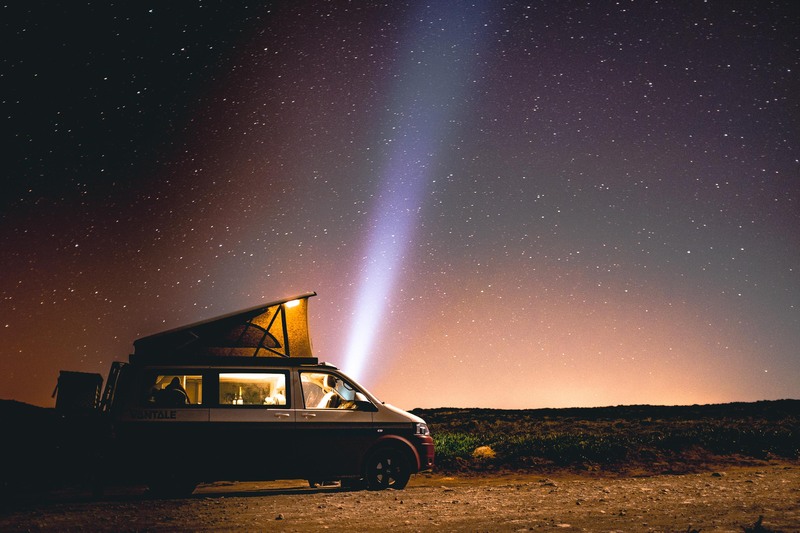 At a time when everything becomes more and more dominated by electronics, you don’t even need a key to turn on the engines of some cars, there is so much talk about connected cars, telematics and self-driving vehicles, good old campervans have even more appeal. A yellow Volkswagen Type 2 appeared in the film Little Miss Sunshine and you may be thinking about the beauty of a van which is not just a mean to get from point A to point B, but which you can park in that quiet panoramic point on the coast, looking at the sea, and having dinner while enjoying the squawk of the seagulls and the light of the sunset. You can also sleep in it, play cards, and be on the move to maximise the ground covered in your trip. 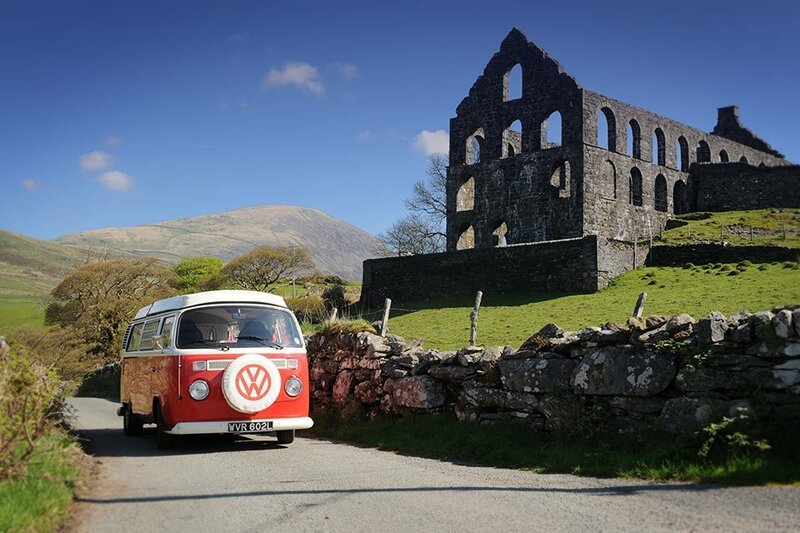 When I learnt that a friend was looking for a vintage VW camper for hire to arrange holidays with her dog, I became curious to find where in England, Wales and Scotland you can hire a dog-friendly campervan for an alternative travel with your dog. We found that most campervan are mostly small family and/or local businesses, and most of them allow dogs, although with some rules and in some cases only on some of their campervans. So let’s start. We ordered the dog-friendly retro campervan hires from the closest to London out and included their dog policies. For some of them we also got some comments from them, and we hope you’ll find this useful. 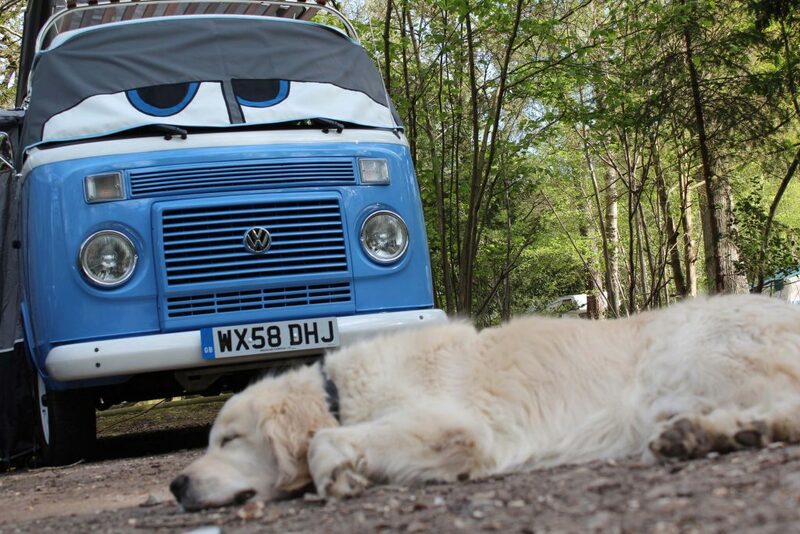 We haven’t tried an adventure with a dog-friendly campervan ourselves (yet! ), so most of the photos in this guide are courtesy of the retro camper rentals mentioned. Real dogs, real adventures. 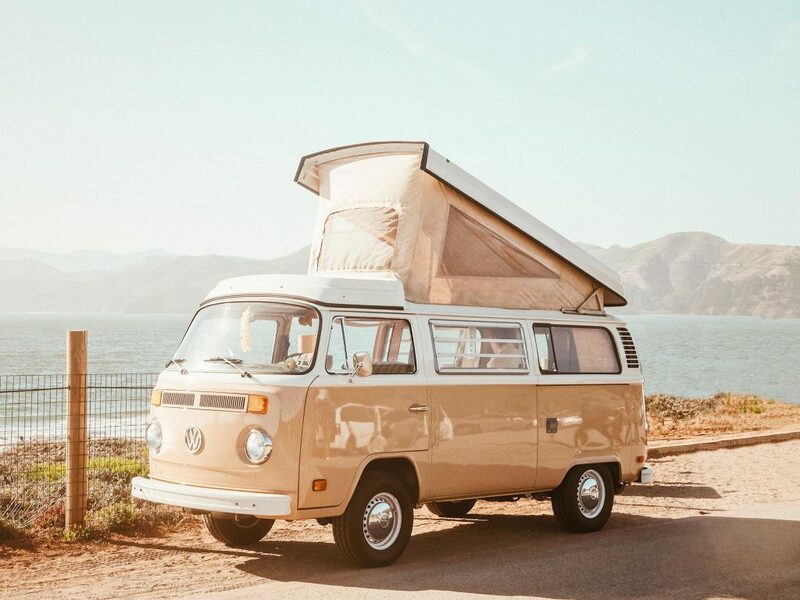 And, oh, each campervan for hire has its own name (Ocean, Basil, Wild Thing, and more) and you will find each has different upholstery and personality, pure 70s’ vintage style or polished retro-chic, here you go! Dub Dub and Away is a family business based in South East London which hires classic Volkswagen campervans. You can take your well-behaved pet for a £30 surcharge to cover extra cleaning. They told us that they don’t currently have an office dog, but the future may see one in it. Funny fact: we asked them if they had any photos of dogs with their campers and they also ended up uncovering a photo of a chicken roaming in front of one of their campervans too! Nathalie and Bailey from Buttercup Bus Vintage Campers | Photo courtesy Buttercup Bus Vintage CampersButtercup Bus Vintage Campers are based in Croydon and cover London, Surrey, Sussex and Kent. They have some lovely Volkswagen campers and welcome pets, with a £25 charge per hire, to cover for additional cleaning. 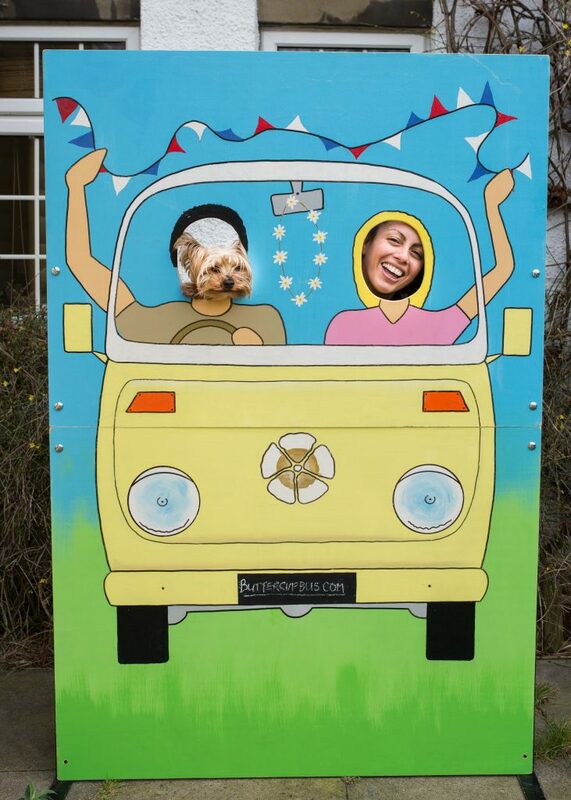 Buttercup Bus Vintage Campervan Hire are huge fans of dogs and they even have a little rescue Yorkshire Terrier called Bailey. 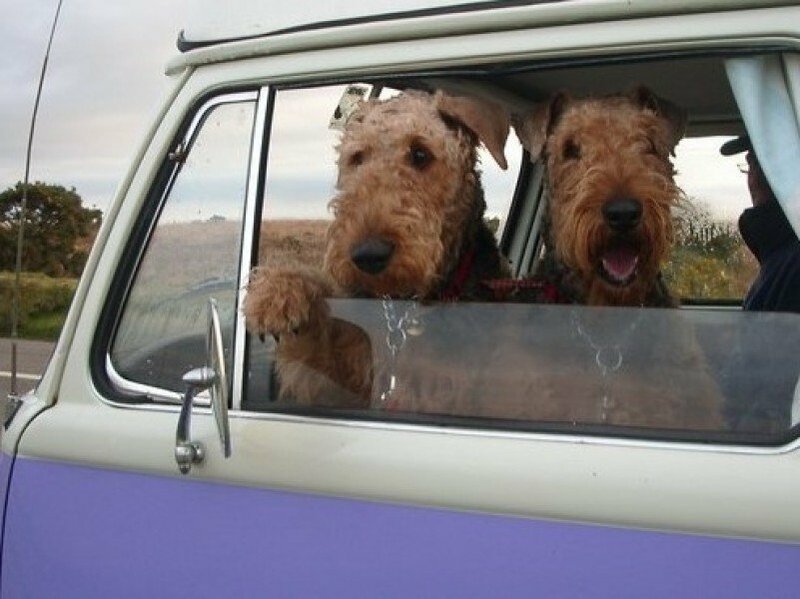 “[Dogs] are welcome to hop in the “woof-wagon” to join you on a self-drive classic VW camper holiday. 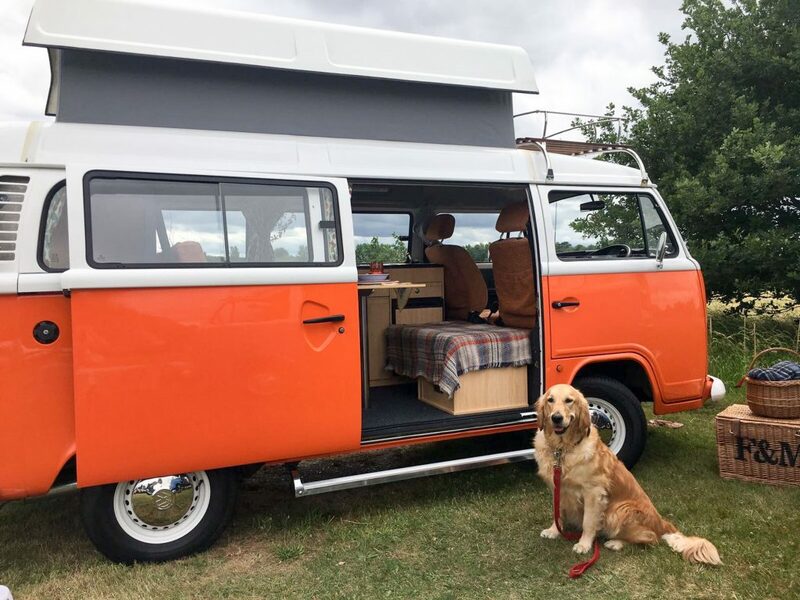 There are many campsites in the South East that are dog friendly – as dog owners ourselves, we are happy to share some of our top locations!”, adds Buttercup Bus Vintage Campers owner Nathalie. Under their point 28 of their T&Cs, pets must be disclosed in the booking form and can be brought into the campervan subject to their approval. Further rules include covering all damage, however caused by your animals (this is a general rule that applies even where not stated for all campervans for hire), undertaking to comply with current law concerning the carriage of animals when travelling in the van at all times and never leaving your dog alone or unsupervised in the campervan. Joyful Journeys is a family-owned VW campervan hire based in Wokingham, Berkshire, some 39 miles West of London. Their two campers are dog-friendly and, very lovely news, there is no extra charge for dogs, just the requirement to cover the interiors with towels/blankets to protect the upholstery and seats. She also told us about a review a customer with a dog wrote last year, and reading it we learnt that she also provided a lovely addition. New Forest Safari Campers has a fleet of lovely retro Volkswagen campers and you can bring your dog on a number of their campers (namely Breeze, Berry and Ocean – there is a discrepancy between listings and FAQs, where they only include Berry and Ocean) for a surcharge of £25. Retro Campers Norfolk is very dog-friendly. They ask that dog beds/blankets are maintain the interiors and that you don’t leave your dog alone in the campervan at anytime. There is a £50 charge which covers an extra special clean for the camper after the hire. On their website, they also provide some recommendations about dog-friendly campsites in the area. The pic above is courtesy of Little Rea, who went on an adventure on campervan Wild Thing. VW Camper Hire, in Southampton, Dorset, close to the New Forest, has dog-friendly vintage VW campers and even has an office dog named Darcy. You can find tips about how to travel with your dog safely on their campervans here. 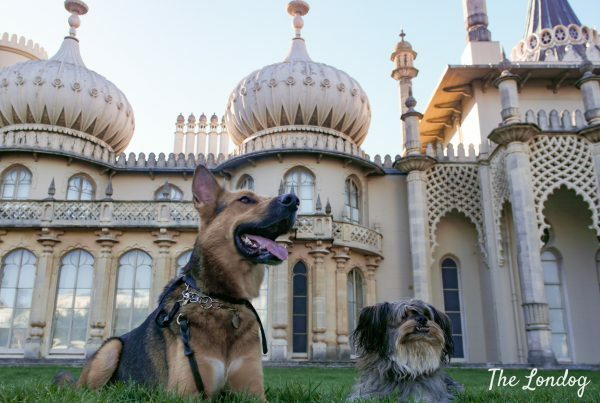 There is a £25 charge for hire bookings where dogs are allowed and it is recommended not to bring more than two medium sized dogs. One thing to remember is that the campers interiors (particularly their upholstery) is expensive, so they recommend to bring some blankets/throws to protect the seats if your dog is likely to paw the upholstery. Moving to Okehampton, in Devon, you can find O’Connor Campers. It has a number of colourful old campers (and few newer ones) for hire and is dog-friendly, allowing maximum 3 dogs per van, applying an extra charge of £30. Cornwall is a wonderful place for a trip and if we think about how our 4-day dog trip would have looked like with a campervan, we could have definitely explored even more than using public transport. 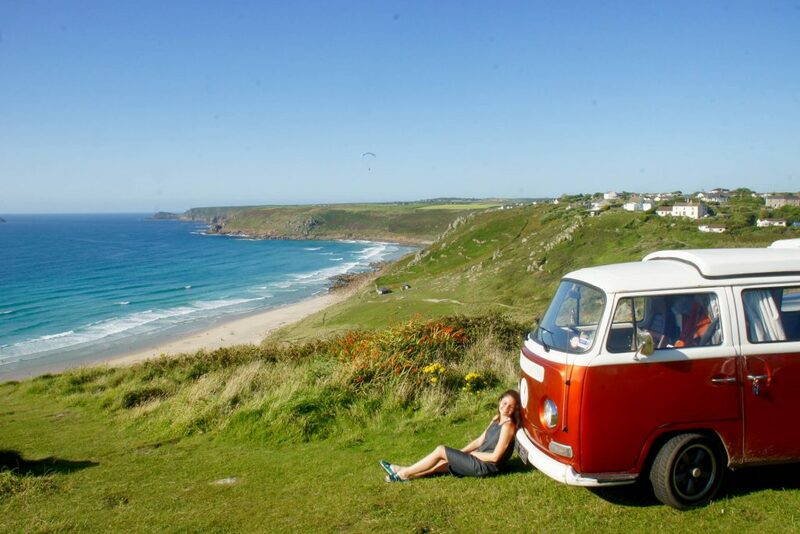 The Cornwall Camper Company has what could make the difference, with Genie, Lilly, Jessie and Peggy the VW campervans. In their dog policy they explain that they charge £50 per pet which covers an extra special clean for the Camper after the hire “because while we know they probably don’t smell – we are well aware that salty beaches and muddy Cornish trails can leave a bit of a pong”. Also, due to the time and investment put into the upholstery of the campervan, dog owners will be required to pay for any pet-made damages. 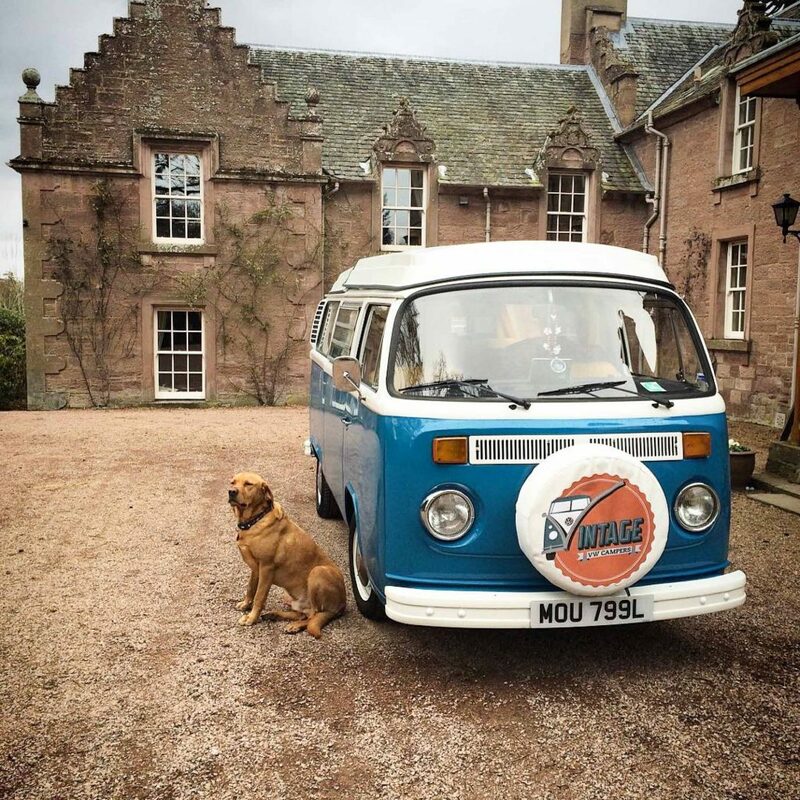 Vintage VW Campers, in Scotland, has a fleet of 7 colourful vintage campers and all of them welcome well-behaved dogs on condition they are disclosed at booking stage. Their FAQs add that dog owners should bring waterproof dog blanket and suitable car restraint or small cage. There is a charge of £20 for extra deep clean per pet per hire. 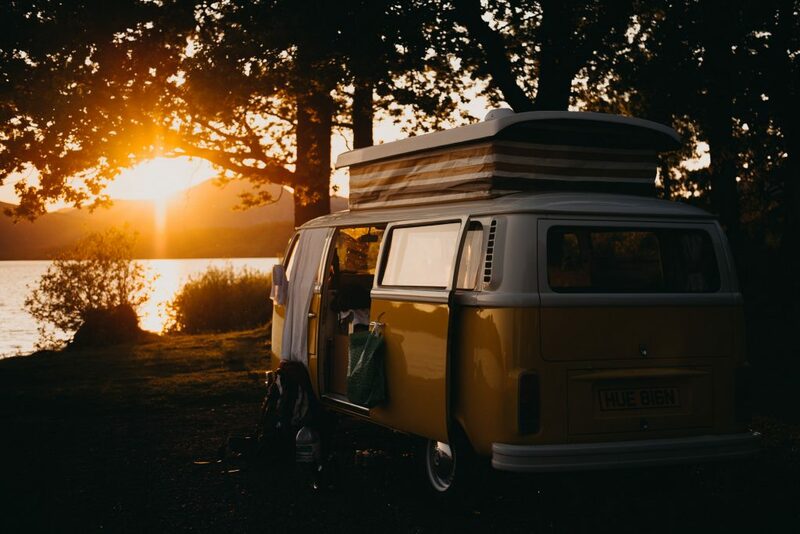 If you are looking for vintage campers for hire across the UK you can also use Camperbug (for England, Scotland, Wales, Ireland and they also have Europe and International sections). In each listing you will find indication of whether dogs are allowed. So now you have your campervan, but where to stay? To make the most of your hire you can sleep in the campervan if it has beds, booking a dog-friendly campsite. Some rentals offer tents which you can use to expand to an extra room too. If you are thinking of a traditional bed, you can opt for dog-friendly glamping site with the camper waiting out of your door. Having a look into vintage cars, it is not easy to find dog-friendly alternatives, as it seems that this is more a luxury not-dog-friendly perk, and many businesses don’t publicise their policies at all. The one we found which has at least a clear policy is Book A Classic, which terms are restrictive and provide “Under no circumstances are animals allowed to travel in Classic Vehicles booked through BAC, unless express prior written permission is given by the Supplier.” If you really want to experience it with your dog it may be worth contacting them to see. We have been desperately looking for a dog-friendly sidecar for hire for a long time. My husband is a biker and I have a motorbike licence too although I have always only driven scooters and my old Vespa. We haven’t found anything within easy reach of London yet, but we came across two interesting things during our searches. Firstly a US documentary about sidecar dogs, Sit Stay Ride (which trailer you can find here), which looks amazing. Secondly, a DIY guide about building a bike sidecar for dogs, not quite our idea, but pretty interesting! We are currently checking a side-car hire in Devon (here and here). If you have any suggestions/tips to share we’d be most grateful!